This Chevrolet Corvette has a powerful Gas V8 6.2L/376 engine powering this Automatic transmission. Ward's 10 Best Engines. WHEELS, BLACK ALUMINUM 19 x 8.5 (48.3 cm x 21.6 cm) front and 20 x 10 (50.8 cm x 25.4 cm) rear, TRANSMISSION, 8-SPEED PADDLE SHIFT WITH AUTOMATIC MODES, SEATS, GT BUCKET (STD), REMOTE VEHICLE STARTER SYSTEM, REAR AXLE, 2.73 RATIO, ELECTRONIC LIMITED-SLIP, PERFORMANCE. Carfax One-Owner Vehicle. 7 Carfax Service Records. *This Chevrolet Corvette Features the Following Options *BATTERY PROTECTION PACKAGE , PLAQUE, PERSONALIZED WITH CORVETTE MUSEUM LOGO, YOUR NAME AND VIN, PERFORMANCE TRACTION MANAGEMENT, NIGHT RACE BLUE METALLIC, MAGNETIC SELECTIVE RIDE CONTROL, LPO, METALLIC GRAY Z51 LOGO CENTER CAPS Genuine Corvette Accessory, LPO, INDOOR VEHICLE COVER, GRAY with crossed flag logo. Genuine Corvette Accessory, ENGINE, 6.2L (376 CI) V8 DI (455 hp [339.3 kW] @ 6000 rpm, 460 lb-ft of torque [621.0 N-m] @ 4600 rpm) (STD), CORVETTE MUSEUM DELIVERY includes (CFX) Corvette Museum logo plaque personalized with your name and VIN, COLOR COMBINATION OVERRIDE provides the opportunity to individualize vehicle appearance by overriding recommended restrictions to exterior, interior and convertible top (if equipped) color combinations, CHEVROLET MYLINK AUDIO SYSTEM WITH NAVIGATION 8 diagonal color touch-screen, AM/FM stereo with seek-and-scan and digital clock, includes Bluetooth streaming audio for music and select phones; Pandora, TuneIn radio, Stitcher and Siri Eyes Free for compatible smartphones (Includes (UQT) performance data and video recorder.) (STD), CALIPERS, RED-PAINTED, BLACK TOP, ADRENALINE RED, PERFORATED NAPA LEATHER SEATING SURFACES, 3LT PREFERRED EQUIPMENT GROUP includes Standard Equipment. *Critics Agree *Ward's 10 Best Engines. KBB.com Best Buy Awards. KBB.com Best Resale Value Awards. *Expert Reviews! *As reported by KBB.com: If you relish the idea of owning one of the best performance-car bargains of the last 50 years, but without feeling shortchanged, you're going to love the 2015 Chevrolet Corvette Stingray. For the Z06, you'll love it if you like performance that crushes European exotics costing twice as much. 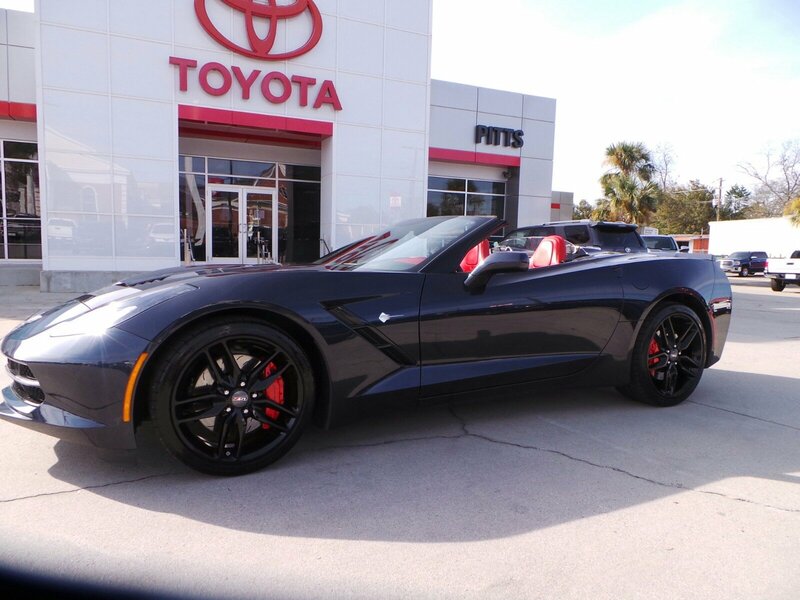 *Visit Us Today *A short visit to Pitts Toyota located at 210 N Jefferson St, Dublin, GA 31021 can get you an exciting Corvette today!